What my face looked like for the majority of the second half of the race. I am glad I am posting this for everyone to see. As you can tell, things went downhill fast (NOT because my quad injury ((I took 5 weeks off from running leading up to the marathon to fix)) was hurting). I would feel the area a little bit if I tried to speed up throughout the race at some spots but NO pain… just awareness of the spot if that makes sense). Let’s talk about what went wrong first and then let’s talk about what went so so right. PS I will be writing a more detailed pool running—> road running post soon! 1. The headwind for a few miles in the first half and then from miles 12-20 in the canyon. As you know, wind is my least favorite thing and it nearly killed me off. It was so strong that everyone I talked to finished about 10 minutes slower than their training predicted. The wind took a lot of energy out of me during that second half which is a big reason why I slowed down so much and I was exhausted once we got out of the canyon but it’s things like that that make us stronger. The biker pacers said that they had to pedal hard even on the downhills during that portion because the wind was so strong. 2. Mentally I was a mess. Brooke was being picked up by her dad during the race to go for the weekend and that put me over the edge when I stopped to say goodbye to her along the course. I always forget how much of running is mental and how I just have to block the really painful things from my brain for the race. She gives me so much strength when I see her during a race but it is always tough to say goodbye especially when I am all emotional from running and I did not expect for it to be so hard on me. 3. Pool running doesn’t prepare you for hills (up or down) and my muscles (or lack thereof) were exhausted. Strength training here I come. 4. My feet lost all of their calluses/toughness over the last 5 weeks from only pool running and not road running. It wasn’t the shoes fault (I have NEVER had blister issues from the Pure Flows except for on Saturday and I have been wearing them for years). The pool really softened them up. I knew I was in big trouble at mile 4 when my feet started hurting pretty bad from the blisters. This is just one of three large blood blisters. My feet are thrashed. It will take a good amount of time to be able to put a pair of shoes back on again. Sorry the picture is gross but we are runners and we all understand. 1. This race is incredible. The Utah Valley Marathon started right on time, there were SO SO many aid stations fully stocked with amazing things (like the otter pop that I had at mile 24), the finish line area was incredible and so were the medals, the course scenery is breathtaking and the expo was great. Everything was marked, there was plenty of space to run at all times and the roads were blocked off and police officers all over the place directing traffic so I never had to worry about cars. I can’t think of one problem. 2. Seeing my family and friends along the way. Family/friends > than getting the fastest marathon time ever. 3. I killed it with my nutrition. I ate a bagel/jam/banana before the race and took in 400 calories of gu (almost every 45 minutes I took one) and plenty of water/gatorade along the course. In previous marathons it is hard for me to even stomach a little bit of fuel so I have come a long way. My friend had a squeeze bottle of gatorade for me at mile 9 and I drank the whole thing. That was SOOO nice because I never felt dehydrated or like I hit the wall because I never ran out of calories (as far as muscle weakness goes—> I did hit the wall:). I am happy about this because staying on top (and ahead) of nutrition and hydration is key for the marathon. 4. Running with my sister was absolutely amazing. I really was ready to quit because of the blisters and other factors when I saw her but she is the greatest human being ever and sacrificed having blisters herself from running in flip flops to get me to the finish line. I walked a little bit each mile (during the last 5.5 miles) until the finish. She kept me entertained, she was so positive and she was exactly what I needed. She knew how important it was to me to finish and she did what it took to get me there (I asked her to make sure I got in to BQ and she did that too). You can read more about her flip-flop running HERE! 4a). My nieces, nephew and bro-in-law scootered next to us for a little while too. It was amazing. 5. I went into the race knowing that I would drop out the second I felt pain from my injury. In 5 weeks I went from not being able to walk up the stairs (I had to crawl up for a few days because it hurt so bad) to Boston Qualifying and I think that is because of taking time off, seeing physical therapists, getting scraped, deep tissue massages, acupuncture, working with my sports medicine doctors, pool running and working hard at cleaning up my nutrition. I didn’t even attempt to run until the pain was completely gone. I am really sore after the race but not injured. Hallelujah. 1. I probably only listened to music for 10 miles of the race. I don’t know why but I just didn’t feel like turning it on for a while. 2. I did not stare at my garmin like I usually do and that was really nice. 3. It has been a long time (2.5 years) since my last marathon and I am excited to be back in the game and see where I can go. Although, I really do love the half and might focus on that for a while after the SGM this fall. 4. The marathon is ridiculously hard but I think that is why people love it, it shows you what you are made of. Tell me about you’re experience with the marathon/half-marathon! Blisters… ever get them? What do you do about them? Hardest race (mentally and physically) that you have ever done? What is going to be the best part of your Monday!? Both my marathon and half marathon experiences were pretty miserable, haha. I ran a marathon as one of my first races ever, and had no idea what I was doing. I was SO proud of myself, but I know I’d do so much better now! I’ve only run one half and I was burnt out mentally the whole time. It can only go up from here! I just get really ridiculous callouses on my right big toe. The best bart of Monday was changing to summer hours at work!! You.are.amazing!!! What a race! And holy smokes, you made it into Boston after an injury. Hello super woman!!! Oh my! I thought I got bad blood blisters! I will never complain again. :) You did an AMAZING job and I am so impressed that you pushed through the mental and got to the finish line. Your sister is amazing, too! My brother did that for me when I ran my first marathon and I will forever be grateful that he helped me reach my goal (though it wasn’t it in jeans and flip flops!!!). Aren’t families awesome!?!? So impressed with what you’ve accomplished! Congrats Janae! What an amazing race. Sisters are such a blessing. I don’t know where I would be without either of them. You are an inspiration. Congrats on finishing with a BQ time! Well done, esp with those feet! I’m lucky to never have blistering, but I lose toenails like it’s my job. Hardest half was Amsterdam – the race stared mid-day after I cheered my friends running the full in the morning. I was so amped! and felt! so! good! that I started at a completely unsustainable pace. For shorter races I can start super-fast and try to hold on, but for the half — its not possible. I ended with a heck of a positive split and walked the last three miles in. Dude- you are some kind of awesome. Seriously. Wow! You’re so inspirational. that’s unreal. Congratulations! I’m attempting my first this year in Melbourne Australia and I hope I just survive it. You’re a champion! Yay for Melbourne, its my PB course and my worst time course as well! Overall its my fave and I’m planning on doing it again this year too. Nice and flat (except km 37 near the shrine)! Finishing a race is already an accomplishment by itself let alone doing it with an injury. I know a lot of people that would not even dare to run after having that injury you are probably already use to it since you’re a runner. I love that you did the race with your family because it made the race extra special. There’s no better motivation than the people that you care for and cares for you back. Although you ended up with blisters and other discomfort I’m sure you felt great after that race almost like all those pain was worth it. I’m a running weenie – got 4 blisters and lost a toenail a couple weekends ago at my first 10K and thought the world was ending haha. I am really happy for you, qualifying for Boston is amazing! I have to tell you, seeing the pictures of your sister running with you brought tears to my eyes. I have a sister who I love dearly and I know you will remember that feeling of appreciation to her forever. I also have a one year old and was so emotional during my last half marathon, I just kept thinking of her and how proud of me I thought she would be if she knew what I was doing. I can’t imagine saying goodbye to my daughter right before the race or during the race, I would have drained my body of all liquids just crying! You are so strong. The best part about my Monday? Reading this marathon recap of yours! Tears in my eyes reading about you and your sister! That is so awesome! And now I’m pumped to go out in the 80+ degree heat and run a short training run (for my first marathon in October). :-) I was just trying to talk myself out of it, but it’s happening for sure tonight! Another 26.2 in the books for you! Way to go! Congratulations on pushing through – awesome job! I haven’t run a full yet, but I really like the half. There’s always a point in a race where I think, “nope, I can’t do this” and then there’s a point where I know I am going to finish. I really like how it challenges me. I don’t usually get blisters, but if I run through streams or in heavy rain I usually end up getting them. Blister band-aids are awesome. So are flip flops. I think my hardest race was my first half marathon. I was way under trained (longest run before race day was 6 miles) and didn’t know if I would be able to finish. It was hard! I have gained so much mental and physical toughness since then! The best part of my Monday is going to be bedtime! You did an awesome job! You should be absolutely thrilled with your effort and accomplishment! You are so inspiring, I whole-heartedly mean it. Not only did you get a BQ, you conquered mental demons and fought through like a champ. I hope to one day be that strong in my running. Congratulations on your amazing race! Sending hugs to you! PS. I totally feel your pain in the blood blister department. I suffered through those at every race over the past 8 months and finally went through a half marathon without a single blister. Seriously, you amaze me! I love to hear about marathon experiences. I find them so motivating and they make me so emotional. Probably because I am a horrible runner! I know, it’s crazy, I read your running blog and am not a runner :) I’m a wanna be runner….does that count:) Anyway, congrats on finishing the beast :) I am so proud of you! Bless you. I am still so amazed that you finished that race on those blisters. I can’t believe that you dealt with that for 22+ miles. i love the picture of you and your sister. she is super human for running that far and that fast with you in flip flops and jeans. best. family. ever. can’t wait until you get to finally cross that finish line at boston. it’s been a long long time coming. and you deserve it! Your sister just reset the bar on how to be a good sister, hahah. Amazing. Congrats!!!! omg the blisters are the WORST! You are just amazing!i can’t even find any more words. Your family & sister are also incredible. Congratulations a million and one times! Congratulations on the BQ! It just goes to show how strong you are! You are blessed with such wonderful friends and family. I’ve had more than a handful of bad races (mentally and physically when hitting the wall) and learn from them. It makes me appreciate the good ones even more. Hope your blisters heal quickly. girl, you deserve every second of that BQ. weird to say I totally adore you?! so inspiring, and this was such a good post. keep up the hard work, but take it a little easy ;) huge congrats! oh, and to your sis- amazing!! you rock, too! You are amazing and it’s so awesome that you can still BQ with all of the “challenges” of the day. I love your race review! You are AMAZING, Janae! Way to go! I still can’t believe your sister ran that far in flip flops (we call them thongs here)!! When I was doing ballet my teacher told me to soak my feet in metho to toughen them up (not sure if its an old wives tale though). My hardest race so far is the Sydney half marathon (but its the longest race I’ve done). Congrats on finishing and pushing through such a tough race! I’m glad you can recognize what went wrong but also the positives about the race! Plus, you had no leg pain!! Blisters can be awful but at least they will heal on their own and they’re not really an “injury”. I sent this edition of your blog to both my sisters. You are so blessed to have such a great sister and I teared up reading your recap and love/appreciation for her. Best Memory Ever! My whole family was at mile 23 of my last marathon where I thought I was going to STOP and pass out. Just seeing them all cheering me on and so excited for me, gave me what I needed to finish! See you in Boston 2015 – I got my BQ too! I am so excited! Reading about those last, tough miles in a marathon always makes me want to sob. Well done and congrats on your BQ! Your poor feet!! Holy cow I can’t believe you had to say goodbye too Brooke in the middle of your race. That is so hard! Thank goodness for family. So proud of you for finishing!! I’m getting back into running since having a baby. My feet are slowly getting trashed. Can’t wait until my calluses arrive! Congrats on finishing the race!!!! I am so proud of you! You did it! You are my inspiration! 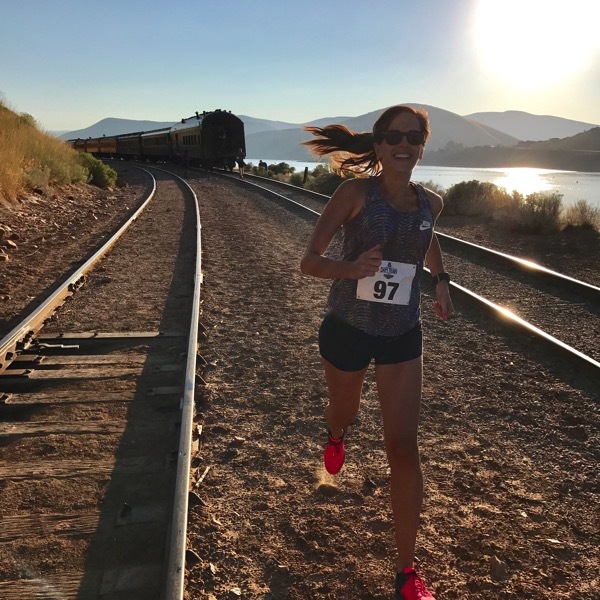 Janae, I just discovered your site and read the recap of the Marathon in Utah. Seriously, this is a great recap and you really had to tough it out.That is a great story about your sister helping as well as how you missed your daughter when she left for the weekend. Non runners may not understand the feelings and how your emotions can go in a race like this. Very inspirational and I am going to definitely read more and recommend this to my wife. Now, all I gotta do is get more inspiration and get back in the Marathon, it has been too long. Your reflection on your marathon is inspiring. I have only run a half marathon and at the finish line remember thinking, “I do not know if I could finish if this was only the half way point of the race.” I still have apprehensions about running a marathon and not have signed up for one yet, but have dreams of running a Disney race. I will work to, for example, be in a good state mentally when I run my marathon someday. Thanks for being so honest, it is greatly appreciated! Great job! I know we’re all self-critical, but I read the post and then looked back at the top of the page and saw you got 3rd for your division!!! :) So that’s awesome. I’m at 1:48 now on the half, working every week to try and get somewhere near your PR of 1:23 at some point, hopefully taking off 5 minute chunks per race (says my overly optimistic self).